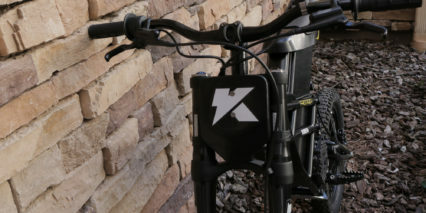 Kuberg is a Czech Republic company that focuses on creating “heavy-duty, high-performance electric bikes that deliver huge power, massive torque and unparalleled acceleration with a build quality that’s engineered to last.” They have dealers positioned around the world, including Europe, Australia and the United States, but design, engineer and assemble all their bikes in the Czech Republic. 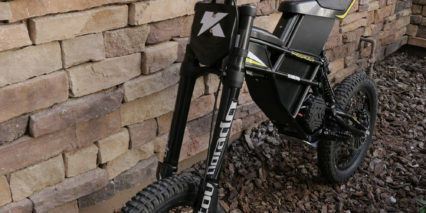 Kuberg has traditionally focused on electric bikes for children, but their newest iteration, the Freerider, is squarely aimed at adults. 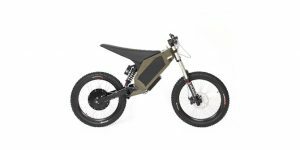 The Freerider is an interesting machine that feels like a hybrid between a high-power electric bike and a full-size electric motorcycle. 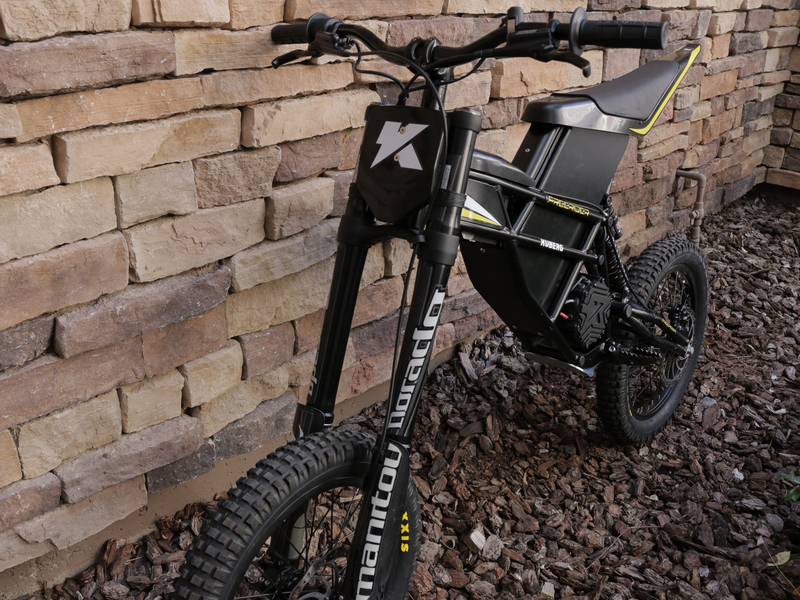 It doesn’t have pedals, so it’s not an electric bike, but it’s also not as a big and heavy as a traditional electric motorcycle, weighing in at roughly 79 lbs. So where does that leave us? 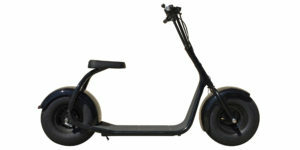 With an electric motorbike? I couldn’t say, but one thing I know for certain is the on-demand 8,000 watts of power makes for an incredibly fun experience. The top speed is ~34 mph but acceleration and torque are high leading up to this mark. 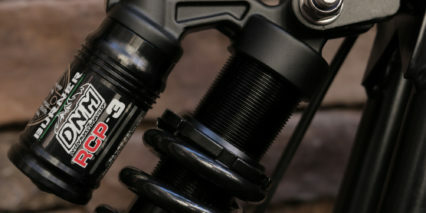 The Freerider’s frame is crafted from powder-coated, double-cradle steel tubing, giving it some serious structural integrity. 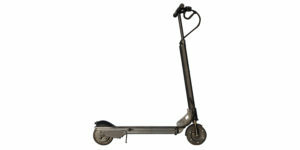 It has a curb weight of just 79 pounds, but only 220-pound maximum carrying capacity. Given the beefiness of the bike (motorbike?) 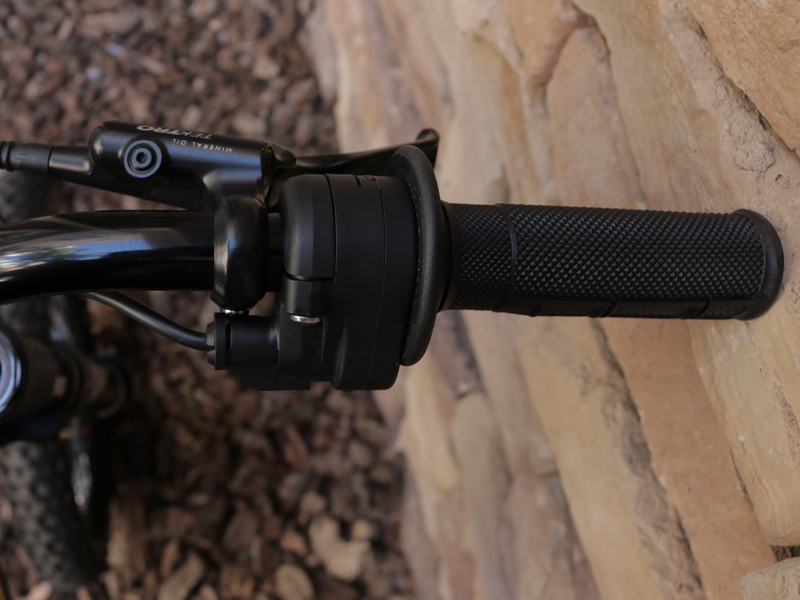 and it’s intended philosophy of use as an off-road trailblazer, I suspect it could handle far more weight, but to be safe I made sure to limit the amount of gear I carried while riding. As a 200-pound rider, I found the Freerider was more than able to rocket me up the steepest hills I could find without so much as a hiccup. 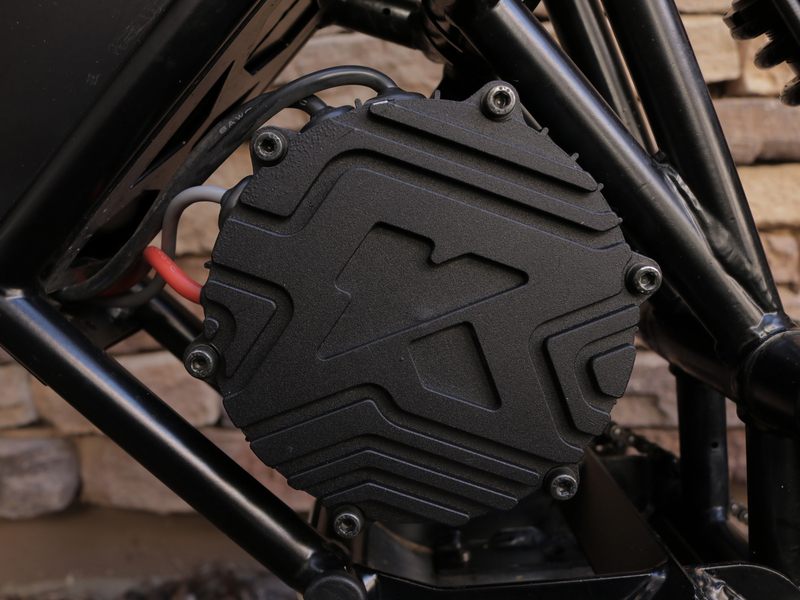 With the 8,000-watt motor the low-end torque is good, but nowhere near as impressive as the 12,000-watt version. 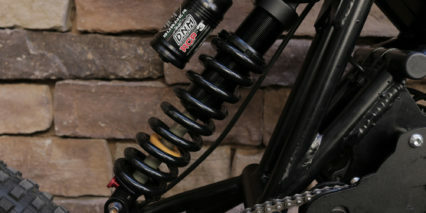 Even still, once my 8,000-watt Freerider finds its way to the middle of its power band it takes off like a missile. 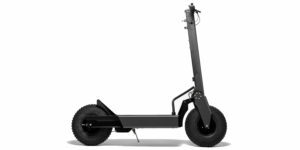 Given it’s size and limited maximum carrying capacity, I was somewhat concerned with really pushing the Freerider off-road, but I found that it was able to conquer every obstacle I put in front of it. Now, that’s not to say a more experienced rider than myself would run into trouble with seriously technical terrain, but in my experience the Freerider performed well. 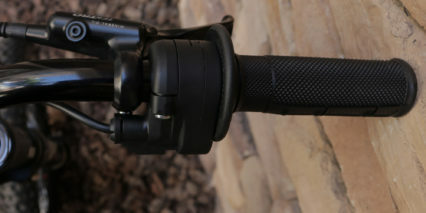 On the right side of the handlebars is a rubberized full-twist throttle, something I was quite excited to find. Growing up tearing through the countryside on dirt bikes and quads, I felt right at home with the throttle. 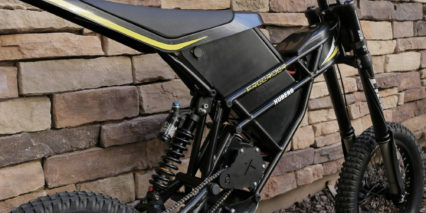 The throttle is also extremely sensitive and is reminiscent of a traditional dirt bike throttle, with the slightest of twists setting you into motion and a seemingly endless range of available speed settings – I never found it difficult to travel at a specific speed. 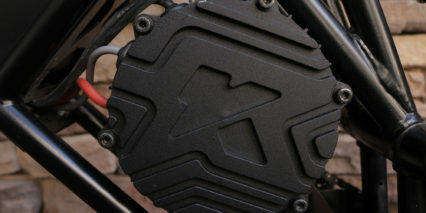 The throttle connects to the 8,000 watt mid-drive motor and power to the rear wheel is virtually instantaneous. I didn’t detect any delay from the time I twisted the throttle to the time I actually felt myself move forward. 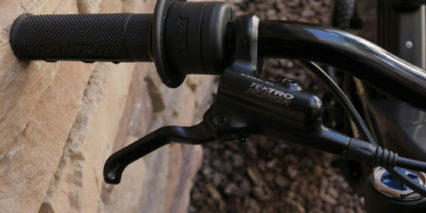 On the right side of the handlebars is also a brake lever that leads down to the front 203 mm disc brake. 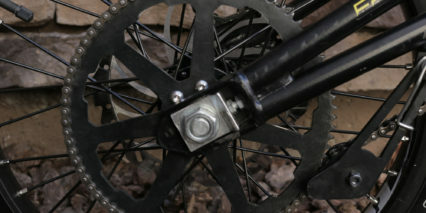 Yes, the front brake. 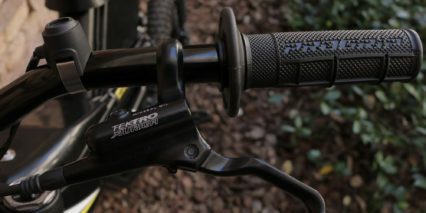 Like the full-twist throttle, having the right brake lever activate the front brake felt familiar and natural, like the olden days of riding dirt bikes. 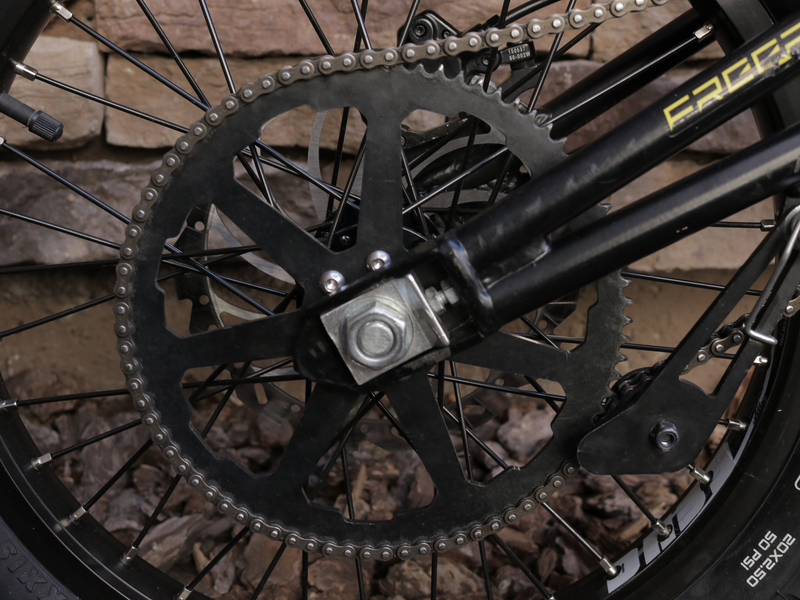 The Freerider has front and rear 203 mm hydraulic disc brakes that are effective given the weight and power of this machine. 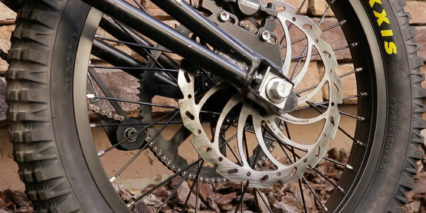 I never found stopping power to be an issue, and furthermore, there was no brake rattle or play in the brake levers themselves. 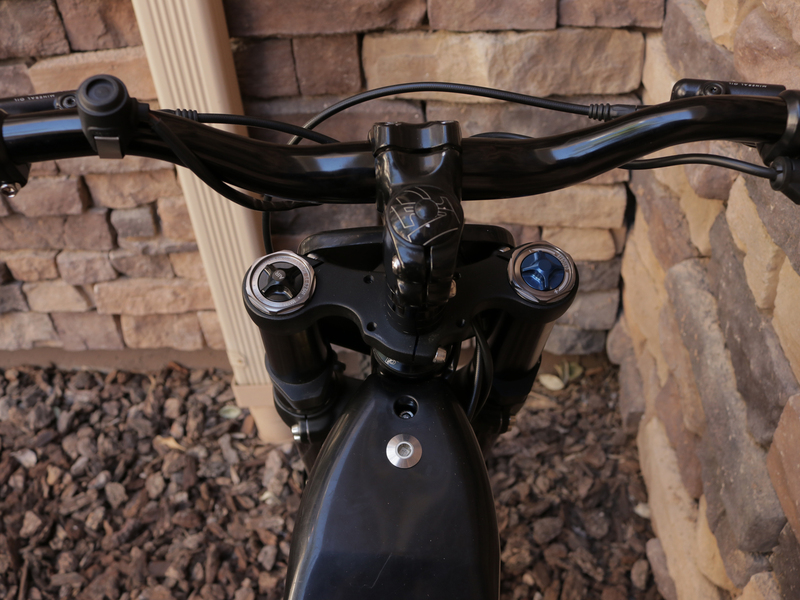 On the left side of the handlebars is another brake lever that leads down to the rear disc brake and a magnetic kill switch, which must be activated for the bike to be powered on. 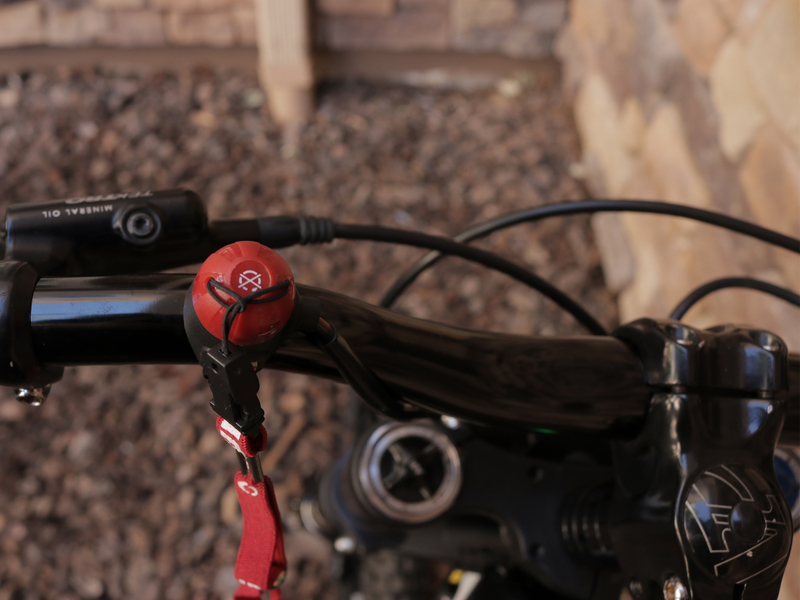 If the magnetic kill switch is removed, the bike immediately powers down. Overall, the handlebars were okay, but not fantastic. 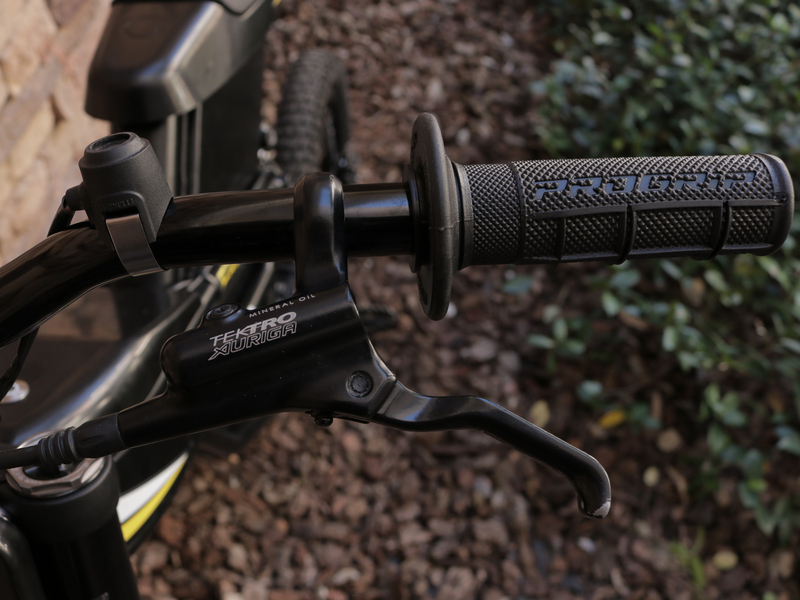 They felt a little narrow to me and though I haven’t tried them, I would recommend the optional upgraded handlebars, which are much wider and look more like traditional dirt-bike handlebars. Unfortunately, there’s no integrated HUD on the Freerider, so managing speed was all done by feel. The lack of a HUD also means I was reliant on the somewhat crude single-LED battery indicator to monitor by battery level. This LED is located on the top of the frame and displays three different colors depending on your battery level: green, yellow and red. Thankfully, there is an option to upgrade to the Streamport, which is Kuberg’s hardwired bluetooth accessory that feeds pertinent information like current speed and battery level to your smartphone via the Kuberg Volt app. 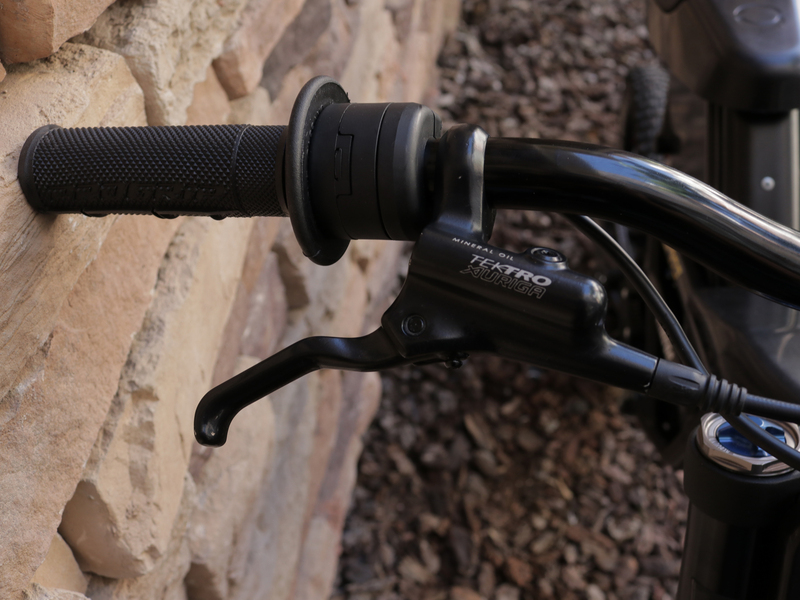 The Manitou Dorado Expert front suspension on the Freerider offers 180 mm of travel and is adjustable with the included air pump. 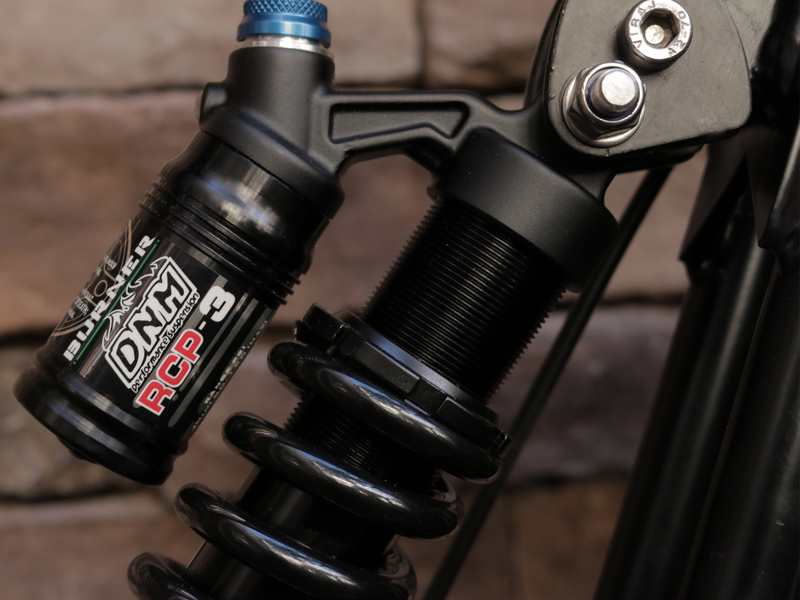 I ended up stiffening up the front and rear suspension a bit as I’m a 200-pound rider – they felt a little spongey out of the box. After adjusting the suspension, however, I found there was minimal dive during hard braking and the rebound also felt more than adequate. I tried to push the Freerider as hard as I could given my experience level and while I wasn’t hitting 50-foot jumps or anything, I was definitely airborne on a handful of occasions and tackled some moderately difficult terrain. 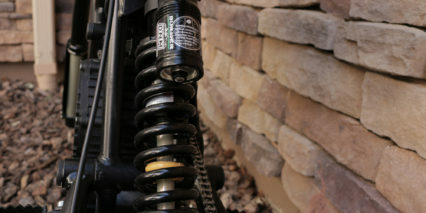 In my experience, the suspension never bottomed out or felt like it was lacking. 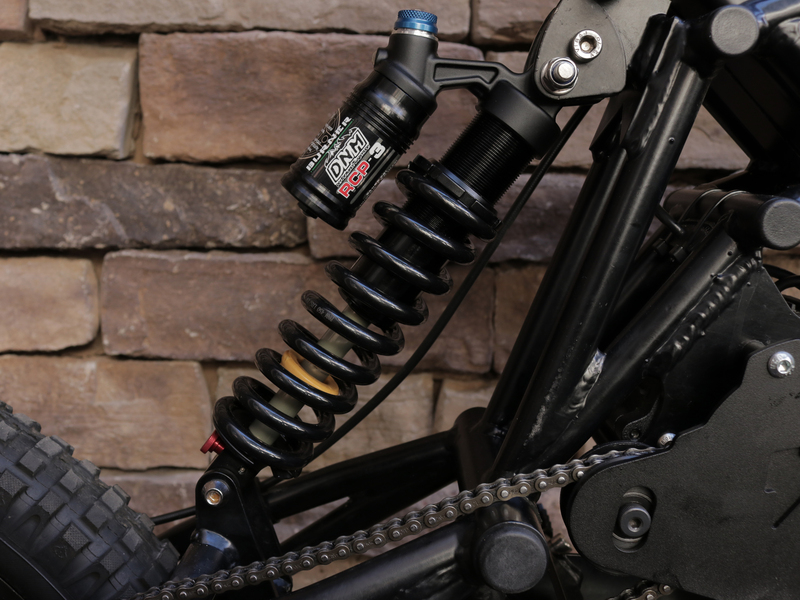 Beneath the suspension rests the front 203 mm disc brake and the standard 20″ x 2.5″ Maxxis Creepy Crawler knobby tire and steel-spoked rim. 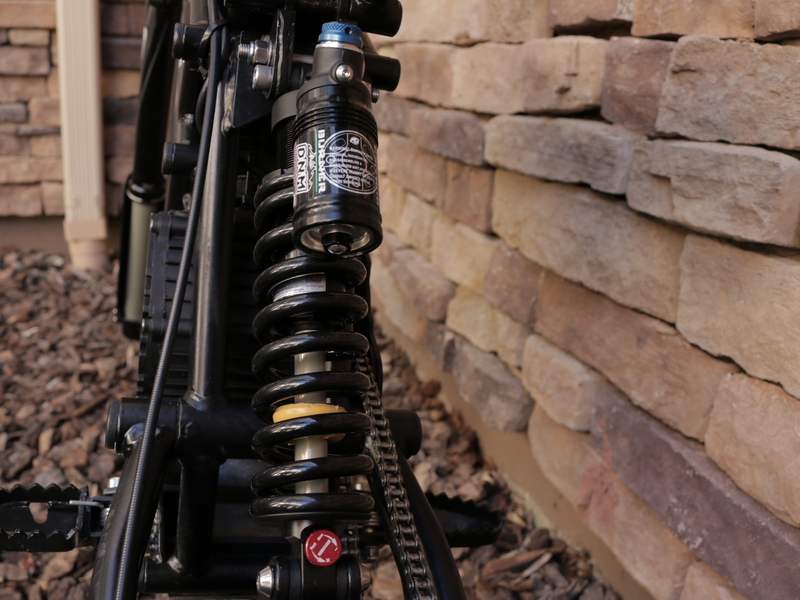 My Freerider came with the optional 24″ front tire but I didn’t feel like I needed to swap them out in order to conquer my trails. 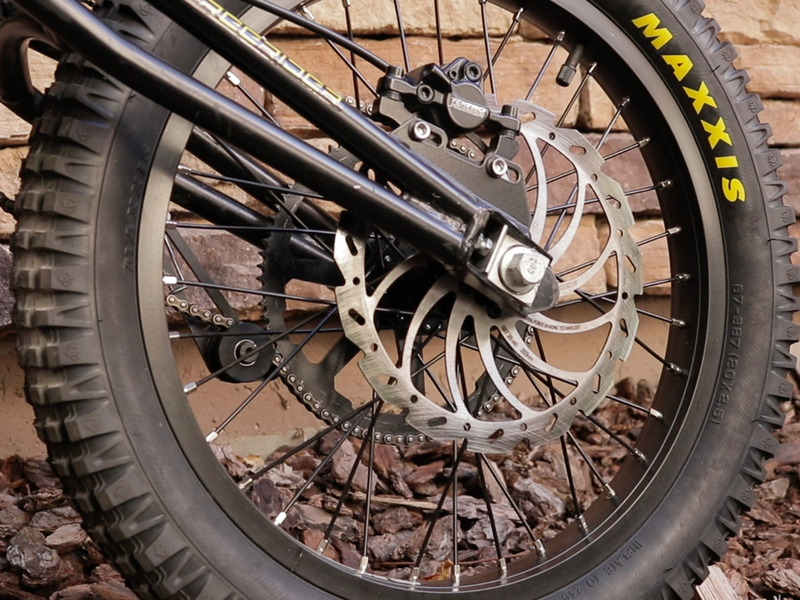 For those who are looking to seriously push the Freerider though, the 24″ front tire may be a good idea as it can make for a smoother ride over rough terrain. I went through a variety of different trails from hard-packed dirt and gravel, trail blazing through the bush, pavement, loose soil and more; I never felt like there was a lack of traction. Riding atop the vinyl-covered foam seat didn’t feel uncomfortable, but it didn’t feel overly comfortable either. The seat was a bit narrow for me and riding for the first half-hour or so was okay, but sitting on the Freerider for longer than caused a bit of discomfort. Of course, most of the time I was transitioning between sitting and standing, but for the sake of information I wanted to see what it was like if I chose to sit the entire time. 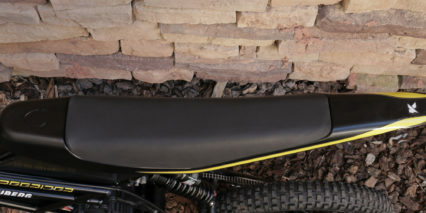 The plus side of having such a narrow seat and frame is that it’s incredibly easy to grip the bike with your legs, allowing for some serious stability even during difficult patches of trail. 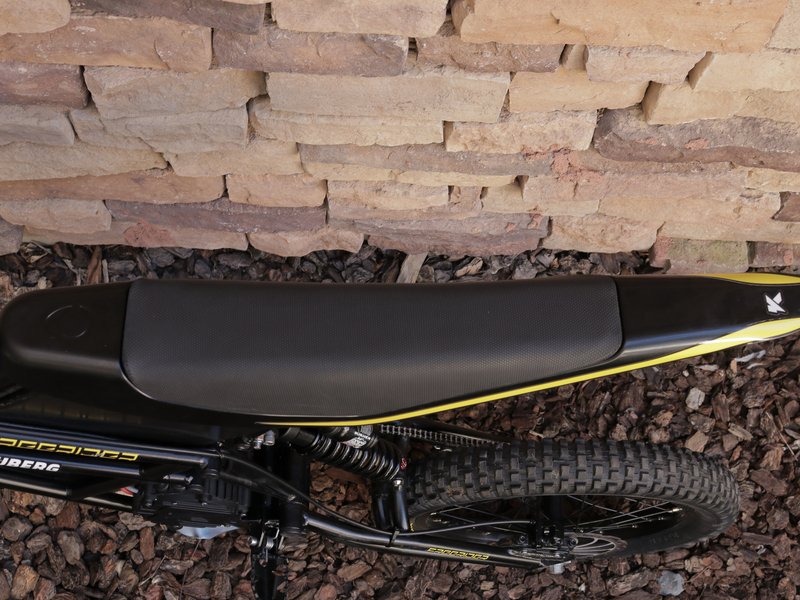 Beneath the seat is the 48v, 22.2ah battery. 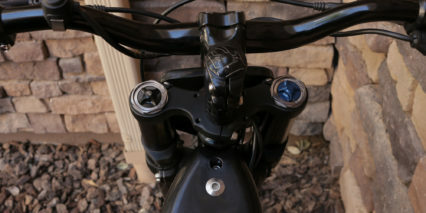 The battery is swappable, though it does take a few minutes to remove the seat and disconnect the battery from the frame. It was difficult to get an accurate max range on the Freerider given the fact it’s an off-road machine. The type of trail I tackled seriously impacted the range, which is to be expected. Kuberg estimates the Freerider will allow for an average of one hour of use, and that was pretty close to my findings as well. 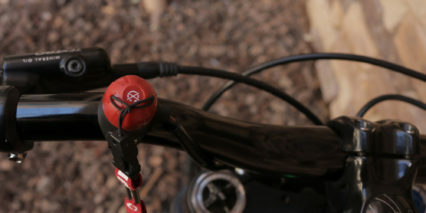 It seemed like despite the various trails I rode, I was able to go for about an hour before the LED battery indicator turned red. I may have been able to ride for longer, but since I didn’t have the optional Streamport I didn’t have a super accurate battery reading and therefore didn’t want to push it and get stranded in the middle of nowhere. Charging the battery takes about two and a half hours, though you can get up to 80% charge in around an hour. This is great for topping off and trying to squeeze in some extra ride time without having to wait the full two and a half hours. 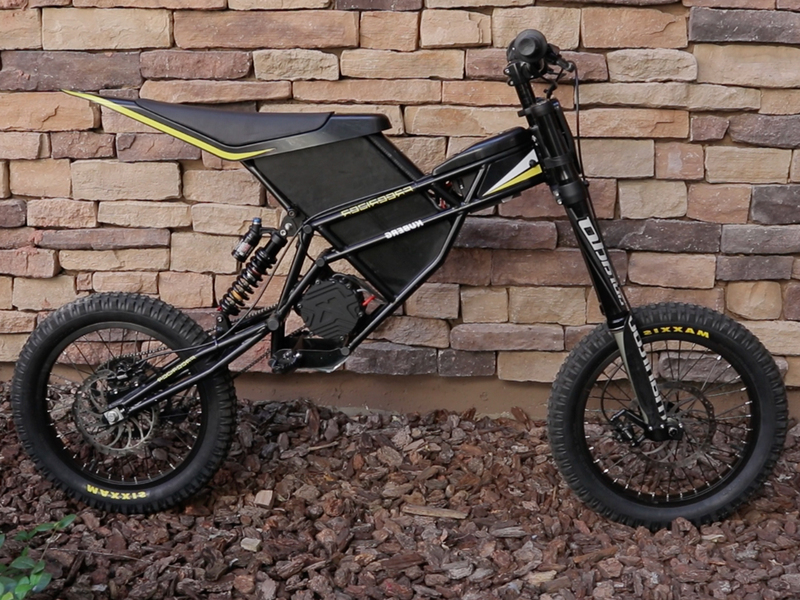 Beneath the battery is the 8,000-watt motor that drives the Freerider to a top speed of 34 mph, and let me tell you, this thing is powerful. Like I mentioned, the torque on this motor is through the roof, especially in the middle of the power band. That’s not to say it’s slow off the line, because it isn’t, but you can really feel the power after about 10 mph. The motor was able to carry me up some treacherously steep hills and I was honestly shocked at how easily it climbed. 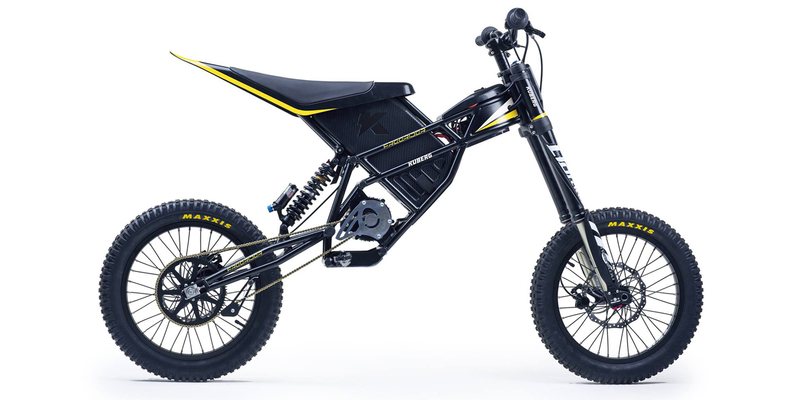 This is likely to do the moderately low top speed – this machine is clearly geared for off-road use. 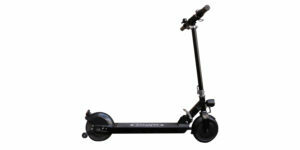 All in all, my experience with the Freerider was more than positive. 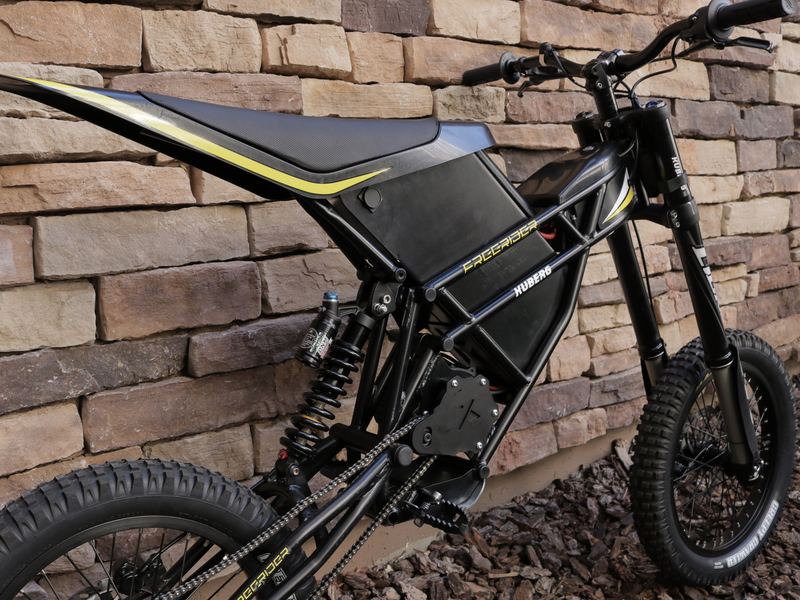 I’m still not entirely sure where this electric bike/motorcycle hybrid fits categorically, but I do know that it’s an extremely fun vehicle to ride. Though not the fastest, it’s certainly the most powerful electric vehicle I’ve tested to date and it was a very unique experience. 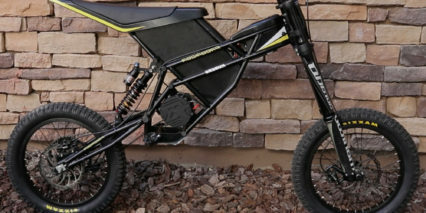 I think the Freerider is a great choice for anyone looking for a true, off-road electric vehicle that can be used to blast through trails, for camping or even as a utility vehicle. 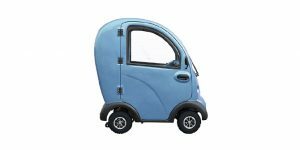 At $3,999 it’s not in the affordable category of off-road toy, but in my opinion you’re getting much, much more than you’re paying for. 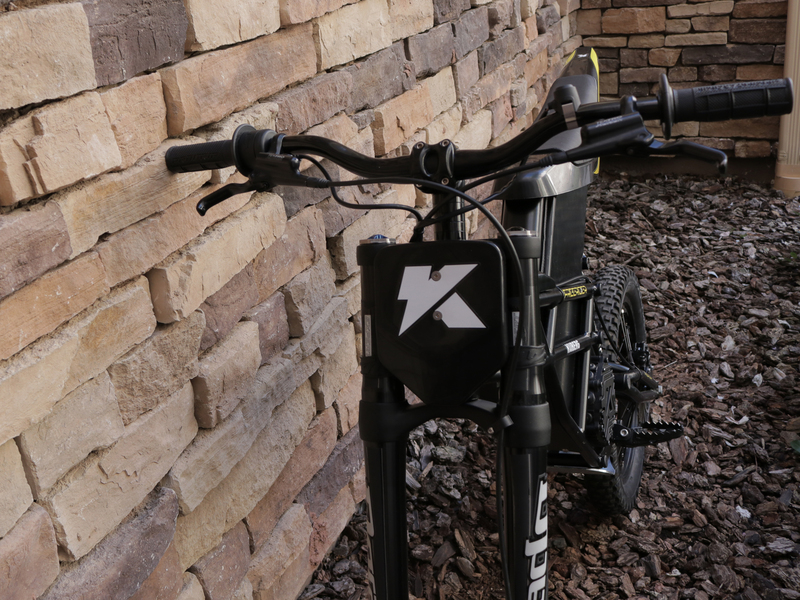 Testing the Freerider was a blast, and I’d like to thank Kuberg for partnering with me on this review and providing a demo unit.